On 8 July, SINPROLAC, the union at Nestlé Nicaragua, held a general assembly to evaluate the results of a series of training sessions - primarily for women, young workers and those reaching retirement age - aimed at consolidating and strengthening the union and to define the issues for the forthcoming negotiations with the company. GMB and UNITE are polling their members at the Kit Kat factory in York over the next steps in a collective bargaining dispute. Representatives of Nestlé unions from across Europe, meeting prior to the European Works Council (NECIC) meeting on June 19, heard details of the recent settlement of the conflicts at Nestlé in Indonesia and Pakistan and reaffirmed their determination to stand together with brothers and sisters at Nestlé whenever and wherever a conflict situation may arise. The United States Occupational Safety and Health Administration has cited Tribe Mediterranean Foods, a subsidiary of Nestle SA, for 18 alleged violations of workplace safety standards following the death of a contract worker at its Taunton, Mass., production plant. The worker, who was pulled into the machine he was cleaning and sterilizing and crushed to death, had received no training in hazardous energy control involving shutting off the machine and its power supply before performing any work. Other contract workers performing the cleaning had likewise received no training. The IUF and Nestlé welcome the settlement of the dispute at Panjang, Indonesia, around the status of 53 employees whose employment was terminated on October 5 and 6, 2011. Nestlé, the world's largest food corporation (which just became bigger with the acquisition of Pfizer's infant nutrition division), has an advertisement for every product, a corporate social responsibility routine for every occasion, a presentation for every financial analyst and an answer to every question save one. Workers at Nestlé Nicaragua, most of whom are women, complain that continuous pressure on the workforce is producing a continuous rise in occupational illnesses and injuries. Nestlé watchers on the company's mailing list may be puzzled by the fate of the message they received on April 12 entitled "Nestlé receives GRI A+ rating for Creating Shared Value report". The original article claimed that Nestlé had received an A+ rating from the Global Reporting Initiative for its 2011 'Creating Shared Value Report'." That claim is no longer made - apparently the communications folks at Nestlé were apprised that the GRI awards no ratings. 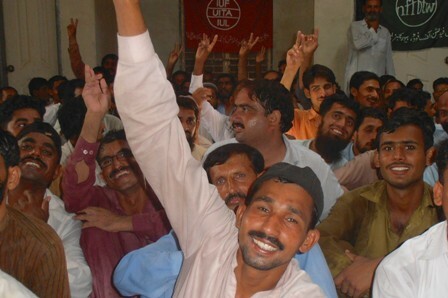 As Nestlé shareholders prepare for the annual shareholder meeting on April 19 Nestlé watchers should note that on April 6 a court in Kabirwala, Pakistan issued an arrest warrant for a manager named Jahangir at the labour contractor which has been supplying hundreds of contract workers under abusive conditions to Nestlé's milk factory in the town.